Always on the lookout for technological improvements and innovations, SRAM continues to impress with its performance-oriented bicycle components. SRAM’s success began with its twist-grip shifters. Today, they produce a wide range of components, including front and rear derailleurs. Although pro riders are enthusiastic about the performance of SRAM’s bicycle components, casual or more amateur riders will enjoy their products too. SRAM is one of the largest and most popular manufacturers of bicycle parts in the world committed to technical performance, lightness and durability in all their products. SRAM manufactures products for both elite professional cyclists and amateur enthusiasts. The company uses the latest technology and research to consistently refine and redefine their products to make sure that they are always at the top of their game. SRAM essentially has four groupsets for road bikes: SRAM Red (being the lightest and most expensive and mainly used by professionals), then descending in order SRAM Force, SRAM Rival and SRAM Apex, all of which are available on Bikester.co.uk. 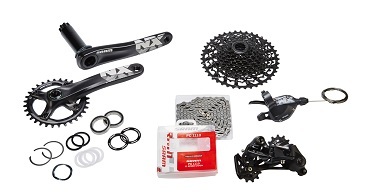 An additional groupset, SRAM X for MTB is also available on Bikester.co.uk. SRAM stands for the founders’ names Scott, Ray and Sam. The company was established in 1987, growing from a single computer and drafting table to a global enterprise and one of the most successful high-end cycling component manufacturers in the world. Each component is usually manufactured in-house at one of their factories in either the US, Portugal, Taiwan or China and then distributed around the world. As a start-up, SRAM introduced the grip shift gear change technology for road bikes in 1988. This technology was then adapted for mountain bikes in 1991. Since then, SRAM has innovated and engineered an extensive range of different components for road, mountain and cyclocross bikes. On the Bikester.co.uk website, you can find a wide range of high-end components, including cassettes, switches, gears and brakes, which will help create the ultimate cycling experience. SRAM Apex is aimed at entry-level bike enthusiasts who want to invest in SRAM’s high performance and durable products. Step up to the SRAM Rival groupset and you’ll experience similar precision and movement as the Force and Red groupings, with the main difference being that the Rival products are constructed from aluminium instead of carbon fibre. SRAM Rival is a product range specially designed for cycling in everyday life. The design in this product range uses the same material as bicycle parts used by elite cyclists. The technology holds the same quality and performance as parts developed for the experienced cyclist. SRAM Force uses a mix of carbon fibre and high-precision alloy parts, making it a serious rival to the highest groupset, SRAM Red. It is even used by professional teams. Expect improved shifting and braking as well as considerable weight savings. SRAM Force is specially developed for cyclists that live and breathe riding racing bikes and is suitable for both amateur and professional cyclists. SRAM Red is the choice of professionals and is the lightest component group in the world. Built to win, it has come first in the Tour de France more than once. SRAM Red achieves lightning quick shifting, powerful braking and the lowest weight possible, thanks to its carbon and ceramic features. The SRAM X range consists of specially developed components for mountain bikes.